Weeks after a couple of Wading River parents told school board members their children’s bus was overcrowded — to the point that some children sit in the aisle on their way to school — the district is expected to speak about transportation in the schools after looking into the problem. 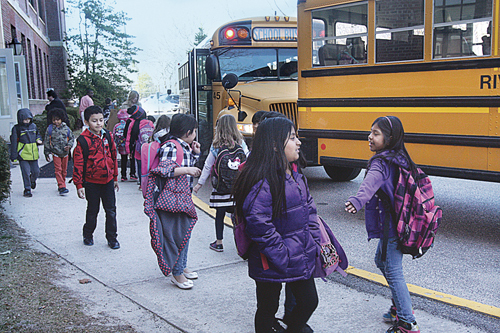 Doreen Moore and Allyson Matwey said that while district policy calls for three children to a seat, the 11 kids at the second-to-last stop en route to the Pulaski Street and Middle Schools are much too big to fit on the bus at the tail end of the route. While 62 kids are on the route for that bus — which is supposed to fit 66 kids once backpacks, sports equipment, musical instruments and the like are added in, there isn’t any room for kids to sit on seats. “You can’t accommodate three children to a seat,” Ms. Matwey said at the board of education’s last meeting on Sept. 9. A more in-depth analysis will be presented at tonight’s board meeting, which begins at 7:30 p.m. at Philips Avenue School.